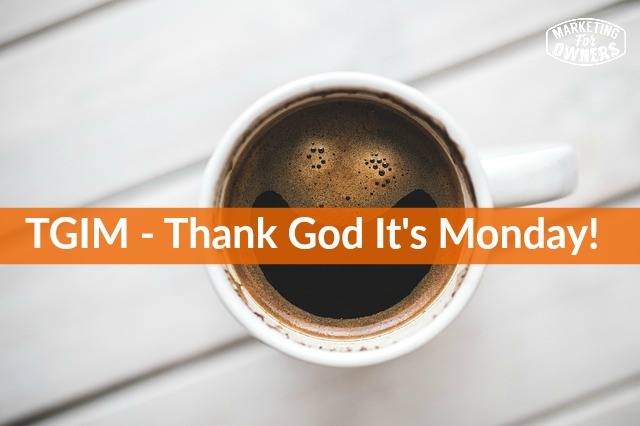 Do you get up on Monday morning and say “Thank goodness it’s Monday!” or something of the equivalent? So, the difference between the two is thank goodness it’s Friday, looking forward to the weekend and no more work because you are sick and tired of it, or, thank goodness it’s Monday, looking forward to the week because you enjoy your work. Well I would like to encourage you to try and change things around so that you enjoy work. It’s also good to try and help the people that work with you or work for you to enjoy their work too. Of course you can’t force anyone but the reason I say this is, we have to work for a long time and for those of you that are much younger than me, you’re going to have to work a long long time because your country, whether it’s the UK, the USA or South Africa, wherever you are, it can’t afford pensions. So if you think you’re going to retire at 60 or 65, unless you’re doing super well and you have saved up, you may have a bit of a surprise. So therefore, you may as well start enjoying what you do instead of hating it. Far too many people don’t enjoy what they do, and there’s ways to fix it, it’s not as bad as you think. Firstly, most of us do everything and that includes doing the things we like doing, which are the things you start with, or the easy things; but we also do the things we don’t like doing but have to be done and the things that are awful. Now they are the ones, the awful ones, the difficult ones, the ones outside our comfort zone are the ones at the bottom of the list. Remember when you get into work in the mornings, you open up your PC or your Mac or whatever it is and the first thing you do is you check your e-mails and you jump on social media because you’re just dying to know if someone has sent you a tweet or someone’s left a message on Facebook, you don’t want to have missed out. Well, that’s not really work, that is doing the easy things and procrastinating on work. And quite often the reason is because the real work is either difficult or not enjoyable. So try this, try getting someone else to do the stuff you don’t like doing. How about that for concept? And try doing the stuff that you do like doing. Now I want to take you back to a time when you started your business or before you started your business. Remember when you dreamed it up, you were lying in bed, you were off on weekends the other things and you couldn’t stop thinking about this a dream business. You worked it through, you worked it through very quickly and then you were there driving along in your Ferrari, driving down to the harbor before you got on to the marina on onto your luxury yacht and sailed off around the world, etc. etc. But I want to take you back a bit when you imagined what you did. How did you see your business? What did you think you would do? Because you won’t have looked into the details, there won’t have been a time in your dreams when you’re answering e-mails, there won’t have been a time when you were packaging stuff and waiting for the carriers or when you were opening the mail. So, what were you doing? There are many many jobs in the business, how about looking for your unique ability, because you are brilliant at something. You may be brilliant at lots of things, but there is something, there are some things that not only are you fantastic at doing, but you enjoy doing and you get great fullfilment. Now I’d like you to try and work out what those are. One way of doing this is, and this sounds ridiculous, but until you do it, it’s actually not that difficult, but to grab a sheet of paper, make a form, do anything you like and just keep a record throughout the day of what you do. Now there are apps and there’s all sorts of things but to be honest I found it easier to just write it down. The first time I tried it, I had some fancy form that I had all sorts of things to fill in, it was ridiculous. In the end I just wrote a form that had two columns and just wrote “Time” and what I did and that was it. And so I could write, I don’t know, “nine o’clock, make a cup of coffee”. How often do you get into work and then make a cup of coffee before you start? Make a cup of coffee, open post, open, turn PC on, all this kind of stuff, if you write it down kind of gets you into a habit and you think by the end of the day, I’m going to have filled out ten bits of paper. But what you find is eventually you start doing things and you might answer some calls. You are not going to write down” Answered call to Jeff, did this…”, you’re going to say, “Answered phone, made outgoing calls”, in batches. Now if you do this for say three days, even better if you can do it across a full working week, a Monday to Friday, to get an average, but if you do this for say three days, at the end, you can look at those bits of paper and start to categorize the things that you did. So you could categorize them into say Admin, Marketing, Production or Social Media or something like that. But start to categorize the things together and then you can work out how much time you spend doing certain tasks. Now as you go down them as well you may notice something that you do that you enjoy from the outside without realizing because we are very busy, we do all sorts of things throughout the day and we don’t really know what we do, so you may miss out a few things. So look at what you actually have done, try and find what you enjoy to do. Also try and identify the things you are very good at. So for example in my day I may sort of say, “Filled in spreadsheet”, but I am no good at spreadsheets, I mean I can open a spreadsheet, I can do spreadsheets stuff. In the old days I used to be able to do lots of formulas but I don’t use them enough. I have people that work for me who are really good at spreadsheets; in fact they just happened to be good at spreadsheets. Ask your staff what they are actually good at. You’d be surprised. And most people by the way was an example, who are good at spreadsheets, don’t realize how good they are because to them it’s natural, they think it’s just easy, they don’t realize how bad you are. Or me, perhaps, maybe they do. For the other one is you can put these tasks out on fiverr, there are people on fiverr that can virtually program Excel spreadsheets and Word documents, you’d be shocked at what can be done by a clever person with some clever coding in the background, for five dollars. So once you have figured out the things that you aren’t very good at and at the things you don’t like doing, then group them in together. Work out roughly how much of the day it took and then see if you can group it into rough jobs. You might call it a virtual assistant, or a general assistant or you may have been doing graphic work on Canva that you’re not very good at and you may put it down as design work. You may have been tweaking your WordPress website, you may say WordPress work, something like that. Try and batch it out and then work out how much time is spent doing these things, then give those away, just try give them to someone, let them learn, take the time. Try and stick to things that you’re good at and see if it starts to change and this is an exercise that can be done with your staff as well. I know you’re going to think, “Well they’ve got jobs.”But they may be doing things that someone else is better at. Work on this, make everyone including you, enjoy your working week. It will improve your life to no end if you actually enjoy doing what you do because you’re going to do it all week, you’re going to do it all year and you’re going to do it next year, and the decade after that, perhaps. So, that’s my tip. Today is the book for the week time and today I have got a good one. This is actually written a few years ago, but it’s still perfect. 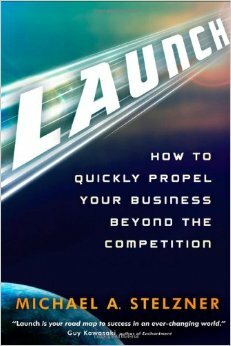 In fact I read it recently because I wanted to know if it was still is applicable, it’s called Launch it’s by Michael Stelzner. Now you might have heard that name, Michael Stelzner is the boss at and the founder at Social Media Examiner, probably one of the world’s top social media news and information sites, absolutely fantastic business. So go off, get Launch by Michael Stelzner. There are other books called Launch so be careful; it is excellent.